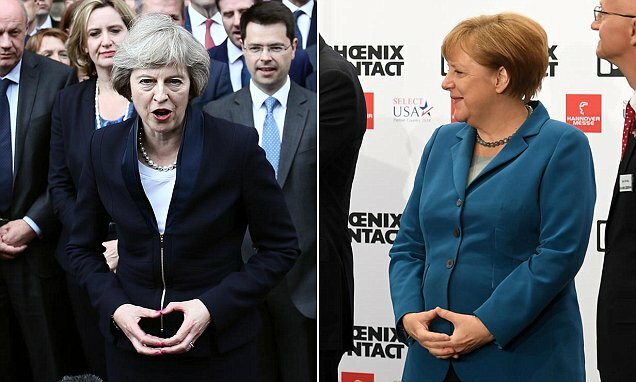 The Chancellor assumed her signature stance (it must be awfully hard to find something to do with idle hands when there’s so much attention on them) during encounters with the press immediately afterward—and there’s even a name for that pose, the Merkel-Raute (Merkel’s Rhombus), which her political party endorsed the emoji version of above. Seeing her standing with poise reminded me of a rather astute observation about other politicians mirroring that gesture (people unconsciously adopt mannerisms like these, usually out of deference) I saw a few weeks ago, like it was some gang-sign for those in the know. I’m convinced that Frau Merkel is the leader of some Illuminati (the hands framing the All Seeing Eye) coven that includes Theresa May, David Icke, Gordon Brown, Jean-Claude Juncker, C. Montgomery Burns and Dora the Explorer. What do you think? I worry that we might now know too much for our own good.